Are you crying? Are you CRYING? There's no crying in BASEBALL! There are many quotable moments to draw from baseball movies, but that one from A League of Their Own remains my favourite. It even goes so far that when someone gets a little weepy around me, this is typically my go-to remark, generally followed by me laughing. I'm a big jerk and I know it. Baseball movies are AWESOME. As a kid, I tended to not be a fanatic sports fan, but flashback to 1993 watching the World Series and Joe Carter hitting the home run that won the series for the Blue Jays? I still remember jumping up and down and crying like a little girl. It's too bad my adult jerk had not yet blossomed; that would have been the perfect opportunity to unleash my favourite quotable moment. I have been doing my best to steer clear of all things horror so I can reward myself come October for Scary Movie Month. So when Daryl suggested we do some baseball-themed watching, I immediately jumped on board. There's no such thing as BASEBALL HORROR, is there? Heh heh heh. If it's out there, I will find it. However loosely related it may be. Batter up! (Ugh..... Ok, I promise to lay off being punny). 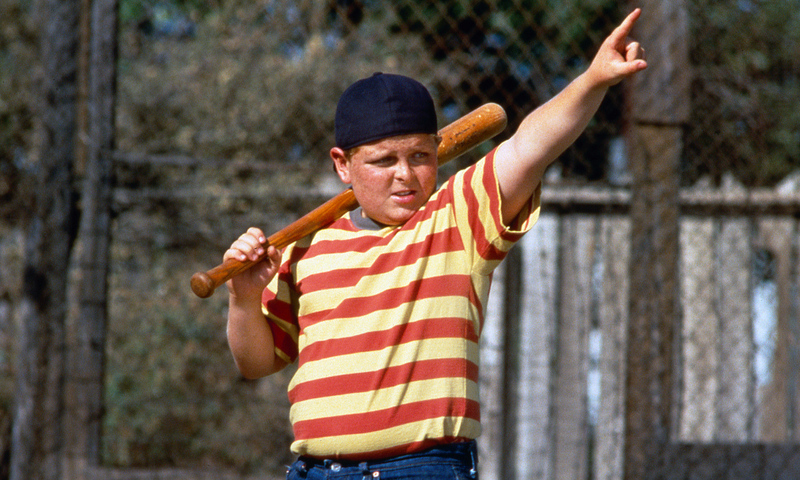 I missed out on The Sandlot when it was released in '93, but this funny nostalgic tale is able to transport me to the twelve-year old I was when I should have watched it and I'm able to see it with my then-kid eyes. My brother and I used to have forts and build tons of awesome tools and devices with our Lego and Mechanix sets. Using our imaginations and weaving intricate stories is all about what being a kid used to be. This movie reminds us of that. Roger Ebert most definitely gets it right in his comparison of the film's theme and narration to a summertime version of A Christmas Story. 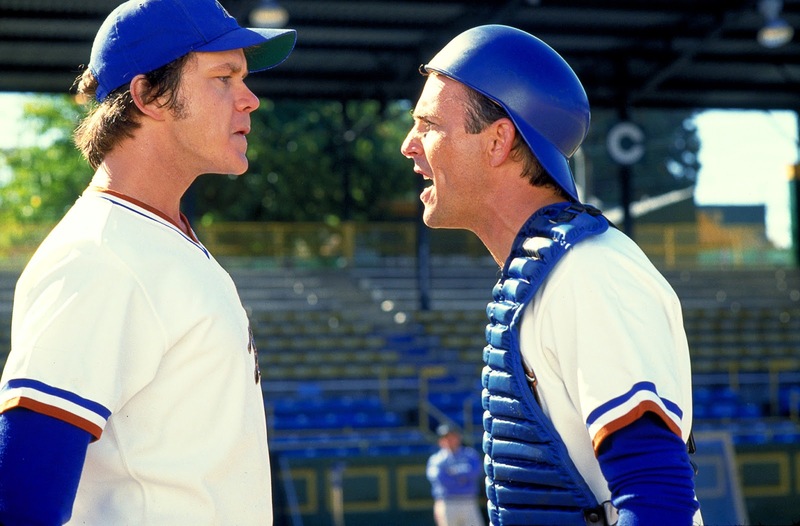 In the realm of sports comedies, Major League has long been a shelved favourite of mine. I had not actually seen it in at least fifteen years (hence the “shelved”), probably closer to twenty, but I found that the things I loved about it then still struck a chord with me this time around. Why do I continue to well up when Ricky Vaughn walks out on to the field to the tune of "Wild Thing?" Who frickin' knows. I LOVE BASEBALL MOVIES is my best guess. HA! Yes yes, the movie is formulaic and predictable. The underdogs shall overcome all odds and win the pennant. But what's wrong with a feel-good movie when the people involved in it LOVE what they are involved in? 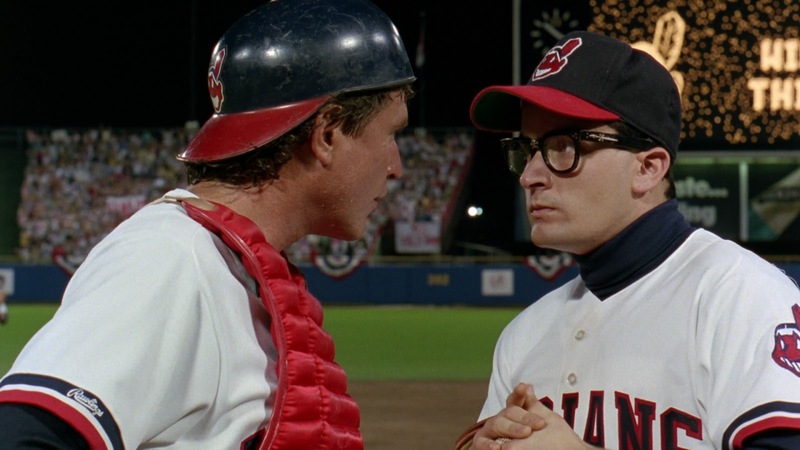 Charlie Sheen used to pitch for his high school ball team and was perfect for this movie in that he had a great fast ball, but it was just as erratic as his character's. (I read some claims that he was the Best Movie Pitcher Ever). The film's writer and director, David Ward, was a Cleveland Indians fan and wanted to create a film about an underdog team. Having followed the Indians for years always hoping they would return to glory, he figured there was no more perfect underdog than them. Back to the shelf you go, Major League. We shall meet again in another decade. The things I seem to love most about all of these movies is that they are made by people who love the game, whether that be due to their involvement with it or to their being a fan. Bull Durham is loosely based on the minor league experiences of the film's writer/director, Ron Shelton, and although he had difficulty in finding a studio to back his project, Orion Pictures came on board and gave him creative freedom. While I am not the biggest Kevin Costner fan (I find most of his acting extremely one-note), he is the perfect choice for this film, especially when you note that he actually hit two home runs during filming of this movie. The baseball is so wonderfully perfect in this film, while the romantic aspect takes on an almost fantasy style. ...But who wouldn't want Susan Sarandon to tie you to the bed... and read poetry to you. 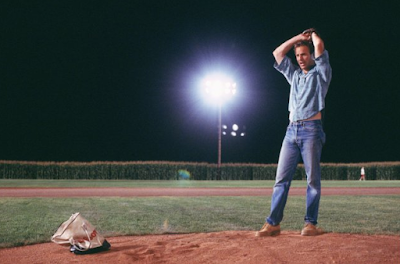 Hot on the heels of Bull Durham, Kevin Costner was initially not considered for the lead role in Field of Dreams, as director Phil Alden Robinson and the producers assumed he would not want to do another baseball movie. After reading the script, he was of course immediately interested and even said he would help with the production. The movie is one about dreams; while it never tries to explain the extraordinary, after the field is constructed it is easy to lose yourself in the fantasy it has created and go along with where it wants to take us. This is another of the films I had not seen since the early '90s, and I was wonderfully surprised at how much I loved it. T'would appear that while I am not a big fan of Costner, I do love me some of his films. HAHA. In a show of raised hands, how many of us were aware that during World War II the All-American Girls Professional Baseball League was an organization (created so that the world of baseball would live on during the war) and that it existed until the mid '50s? Not this girl. Until Penny Marshall's A League of Their Own was released, I would wager that many of us were unaware. Being a HUGE fan of history, baseball movies and Tom Hanks, this film was made for me. I mentioned in my last piece that I have been giving a lot of thought to my favourite movies of all time. This is most definitely a contender for a Top Ten position. It's a perfect balance of sentiment and sass, and the recreation of old film footage adds an extra historical touch amidst a tale of sisterly love and overcoming a symbol of the times. I have drawn so many quotes from this movie that with this re-watch I discovered that some of my “original” quips were, in fact, borrowed from the film. Whoopsie Daisy! Heh heh heh. Turns out if there is a baseball (ish) horror, I would find it. Well.... Patrick would recommend it and I would read about it and then realize it was just what I needed to cap off my baseball theme. BAM! (The term BATTERY refers to the catcher and pitcher duo in baseball, and they might also be called BATTERYMEN or BATTERYMATES of one another.) What will you do when the Zombie Apocalypse is upon us? How will you cope with the fact that there is essentially nothing left of the world you knew and that the danger of death is always but a slow step away? Jeremy Gardner's 2012 anti-zombie zombie movie The Battery (which he wrote, directed and starred in) contains incredibly played dialogue, incredible acting and so much heart. I haven't been able to get Rock Plaza Central's “Anthem for the Already Defeated” out of my head, and the song plays in my second favourite scene in the movie (the final scene being my absolute favourite.) An unlikely duo, thrown together by circumstances beyond their control, The Battery is a team that will be forever bonded, each one relying upon the other. Baseball movies rewind us to a simpler time when baseball was still a sport and the industry of today's baseball was non-existent. People played it because of the love of the game, not for the million dollar paycheque. And while much of that seems to be forgotten in the reality of today, we are always able to revisit the films that have been lovingly made by those who love the game. Living in a country where no one plays baseball and never having seen an actual game, there's absolutely no reason why I should like baseball movies. Yet, if I see a frame of Major League or A League of Their Own (especially the former) on TV, I'm hooked for the duration. Those movies just do everything right and make me genuinely cheer for the players. Loooove them. Thank you for the article, a great read. And now you've put it in my head, I can't not watch Major League tonight. 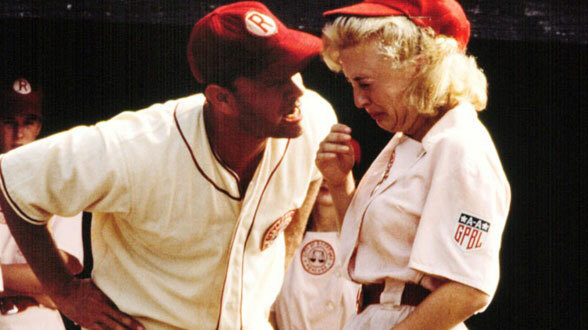 I´m also living in a country where no one plays baseball but I really like baseball movies, especially the wonderfully touching Field of dreams and the great A league of their own. Give me a title like 42, Bull Durham, For love of the game, Major league, Moneyball, The rookie or Hardball, I´m in. I even had fun with Angels in the outfield back in 1994. 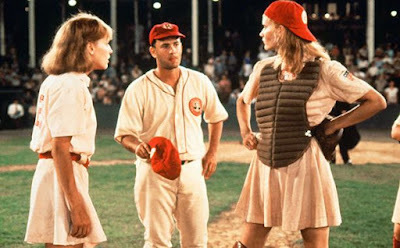 Oo, a League of Their Own - the only baseball movie I know :) Having recently moved from a place where barely anyone plays baseball, to NYC where almost everyone has a favorite team, I thought yesterday about baseball in movies. I'm afraid I'm not a fan of watching baseball in person or even on TV, but I was thinking perhaps baseball makes a particularly good sport for movies because there's so much physical space in the field to set up the shots, and the format of the game makes it easy to create suspense. Can't quite think of another sport - besides one on one's like boxing - that gives such clear visuals in movies. (I didn't think that hard, though - it's an idea floating around in my head). I guess Bingo Long' Traveling All-Stars (or whatever) loses out by omission? Finally got around to checking out The Battery last night. Thought it was really well done and although a bit slow it still keeps you interested. It's a simple film that most people would think is The Walking Dead lite but there's more heart in this and the characters are written pretty well. Only thing that bugged me (and this is really nitpickey) is the concept of "tuning out with headphones" had already been visited and done to much better effect in 2007's The Signal. Overall I thought it was pretty good though. Also of note: The Director, Writer and Actor, Jeremy Gardner, was also in Benson and Moorhead's Spring and is going to be in the upcoming next film from Joe Begos (Almost Human) called The Mind's Eye. I finally caught Spring just the other night - really liked it - great performance from the lead guy especially but enjoyed Jeremy's appearance as well. I haven't seen The Signal but probably should? I definitely think it's worth watching. People have really mixed feelings about that film though. I really, really loved it. Some of my friends hate it. It's kind of a mess but really ambitious. That word gets thrown around by me a lot but The Signal is the definition of it. It's a bunch of ideas put into one movie which I think works to great effect. The first part is horror, second part black comedy, third part weirdsville all wrapped up in a sci-fi universe. I would also keep in mind that it's from 2007 so many of the things in the movie were ahead of it's time, in my opinion. Oooh I actually like the sound of that. I'm an AJ Bowen fan too so that can only help, right? Yep, he's great in it! That's the movie where AJ Bowen first came on my radar. I'm a big fan of The Signal. I don't think the final third works as well as the first two, but like Chaybee said it was doing something that wasn't being done in 2007 as far as indie horror goes. I love that you're a fan, Patrick. I have had to straight up defend this movie to people. It's funny how great a setting baseball makes for movies - I haven't seen all of the ones on your list, but of the ones I have, I love them all. The Sandlot and A League of Their Own especially are movies that I can't stop watching whenever I stumble on them. And The Battery, man, not just a favourite horror movie, but a favourite movie period. Great article Melissa and Go Jays! Damn you Jays!!! (eh um, lifelong Yanks fans here). *ducks from projectiles thrown through the screen from Sol and the White Sox massive on here. Yanks fan?! Hey look over here, folks - we found something to not like about Chaybee! Booo! Hissss! I forgot how big a trend baseball movies were during that period.